Transmission Options: Kubota’s transmissions are built by Kubota and specifically designed to maximize the speed and torque to meet your needs. Fully Synchronized Main and Shuttle Transmission (FST) –The 8F/8R FST features two ranges and a fully synchronized main gear shift for easy shifting – without stopping; Glide Shift Transmission (GST) – Easy-to-use, featuring 12 speeds and clutchless operation to allow for greater speed matching with effortless shifting on the go; HST Plus Transmission – 3-range HST Plus transmission is easy to operate and comes with many other features to increase tractor productivity; Auto Throttle Advance – Automatically increases engine RPMs when transmission speed increases, then decreases engine RPMs when transmission speed decreases; Hydrostatic Dual Speed (HDS) – Allows for Hi-Low ranges in addition to the 3-Range HST which allows you to choose a lower or higher set of speeds within each of the main Hi-Medium-Low ranges; Auto HDS – Automatically adjusts the HDS depending on how much load the tractor is taking on; Adjustable Sensitivity – Adjusts the speed of response from the treadle pedal when increasing or decreasing speed; Cruise Control – Allows the operator to maintain a constant speed without keeping their foot on the treadle pedal; Stall Guard – A great feature for first-time users, the stall guard prevents the tractor from stalling out, even under heavy loads. Front Hitch: With two Kubota exclusive 4-point quick connect front hitch options, attaching front implements like blades, sweepers, snow blowers and flail mowers has never been easier. 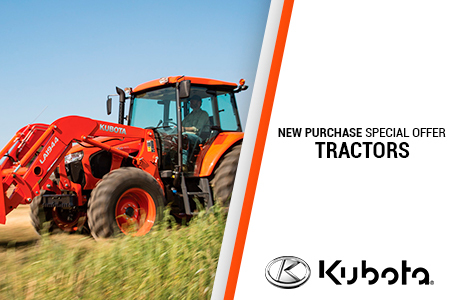 With a choice between a manual and fully auto front hitch, Kubota answers your needs for versatility. Available Implements: 62”/64”/72”/74” Utility Snow Blower Options, 74” & 80” Commercial Snow Blower Options, 60”/72”/84” Front Blade Options, 60” & 72” Rotary Sweeper Options, 72” Flail Mower. Performance Matched Front End Loader: Kubota Built Front Loader – Kubota’s front loaders are built by Kubota and specifically designed to maximize the performance of the front loader and tractor; Standard 2-lever Quick Coupler – The standard mechanical or optional hydraulic 2-lever quick coupler make removing and attaching loader attachments quick and easy, with no tools required; Optional 3rd Function Valve – For attachments that require hydraulic power such as grapples; Easy-to-Remove – The Kubota LA555, LA805 and LA1055 front loaders are designed to be easy-to-remove and reinstall – without tools –whenever the job demands it; Maximum Visibility – Kubota’s front loaders come with a curved boom design for optimum visibility; Ease of Use – With plenty of lift capacity, simultaneous lift and curl functions and a standard 2-lever quick coupler, the Kubota LA555, LA805 and LA1055 front loaders make it easy to complete your task with speed and ease. Performance Matched Backhoe: Kubota Built Backhoe – Kubota’s backhoes are built by Kubota and specifically designed to maximize the performance of the backhoe and tractor; Easy-to-Remove – The Kubota BH77 and BH92 are easily removed without the use of tools; Optional Mechanical Thumb – Adding a thumb increases versatility and makes lifting objects even easier; Ease of Use – Designed with plenty of dig depth and reach, smooth hydraulics, cushioning valves to prevent shock when the dipper reaches the end of the cylinder stroke and ample room for the operator, you will find the BH77 and BH92 are not only easy-to-use, but also a pleasure to work with. Designed to Perform: The Grand L60 Series is designed with strength and durability in mind, featuring: Kubota Diesel Engine – Kubota is the #1 manufacturer of under 100 HP non-automotive, multi-cylinder diesel engines in the World; Common Rail System (CRS) – The CRS system delivers greater fuel savings, less engine noise and vibration and better emissions, while still maintaining a high level of power and torque; Kubota Performance Matched – The Grand L60 Series is built by Kubota for Kubota, it’s not a rebranded product built and distributed by multiple manufacturers; Metal Hood and Fenders – Strong and durable metal hood and fenders will not only protect your equipment, but keep it looking good for a long time to come. 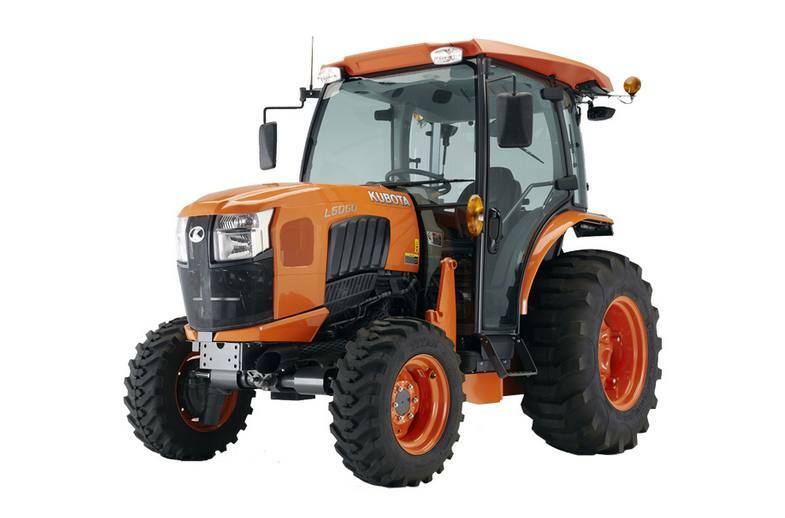 Premium Tractor: The Grand L60 Series is designed with deluxe features for optimum comfort: Spacious Operator’s Station – Easy to get on and off with plenty of leg room to increase operator comfort; Modern Dash Panel (ROPS Models) – Easy-to-read with all the information displayed right in front of the operator; IntelliPanel Display (Cab Models) – Stay up-to-date with our easy-to-read display, showing all of your information right in front of you; Easy-to-Use Controls – Simple controls that are easy to understand and operate, even for first time users; Kubota Treadle Pedal Design – Effortlessly change speed and direction using Kubota’s forward and reverse treadle pedals; Deluxe Suspension Seat with Armrest– Increases operator comfort; Optional Air Ride Suspension Seat – Further increases comfort by absorbing shock; Tilt Steering Wheel – Allows you to adjust the steering wheel for maximum comfort; Rubber Floor Mat – Reduces noise and vibration, creating a more comfortable ride while decreasing fatigue; Cab & ROPS Version – Available with either economical ROPS or the comfort of a climate-controlled cab; Transmission Options – With a choice between the Kubota built, easy-to-use HST Plus, Glide Shift (GST) or Fully Synchronized (FST) transmission, you’resure to find the right balance of speed and torque to get your job done quickly and efficiently; Cruise Control – Allows the operator to maintain a constant speed without keeping their foot on the treadle pedal; Hydraulic Live-Independent PTO – Easy-to-use, no clutching or stopping; Ready for a Long Day – Standard cup holder, tool box and large fuel tank capacity; Power Steering – Hydrostatic power steering to increase smooth operation in tight turns.